129 May 1936 The W.C.T.U. 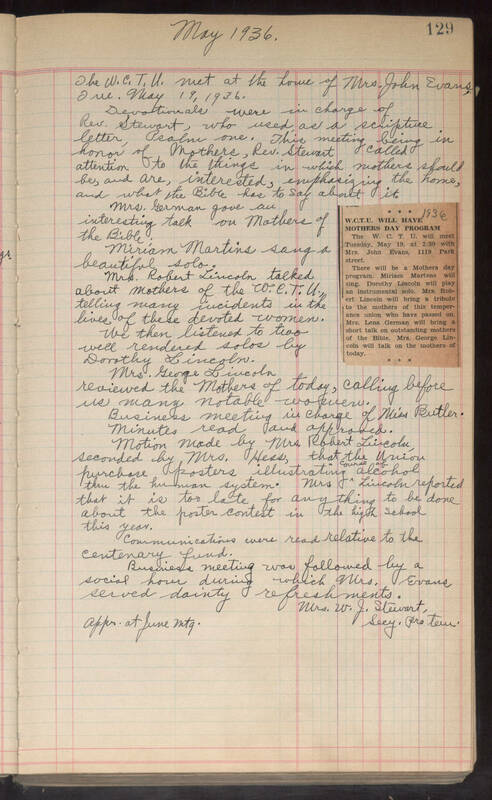 met at the home of Mrs. John Evans, Tue.May 19, 1936. Devotionals were in charge of Rev. Stewart, who used as a scripture letter, Psalm one. This meeting being in honor of Mothers, Rev. Stewart called attention to the things in which mothers should be, and are, interested, emphasizing the home, and what the Bible has to say about it. Mrs. German gave an interesting talk on Mothers of the Bible. Miriam Martins sang a beautiful solo. Mrs. Robert Lincoln talked about mothers of the W.C.T.U. telling many incidents in the lives of these devoted women. We then listened to two well rendered solos by Dorothy Lincoln. Mrs. George Lincoln reviewed the mothers of today, calling before us many notable women. Business meeting in charge of Miss Butler. Minutes read and approved. Motion made by Mrs. Robert Lincoln, seconded by Mrs. Hess, that the Union purchase posters illustrating course of alcohol thru the human system. Mrs. Lincoln reported that it is too late for anything to be done about the poster contest in the high school this year. Communications were read relative to the centenary fund. Business meeting was followed by a social hour during which Mrs, Evans served dainty refreshments. Mrs. W. J. Stewart, Secy. protem. Appr. at June mtg. small newspaper clipping in middle right portion of page.